In this New Year, I’ve been slow to step away from the warmth of Christmas into the open expanse of January. It is silly, really, how I think in patterns. I felt somehow safe in the year 2014, because the pattern of that year had been an uplifting one. Now, I am outside its familiar bookends. 2014 is on the shelf. It was a happy story, contrasting with the year before it, which was a story full of tension and growth. What will 2015 hold? Cynthia Rylant, one of the children’s book writers I most admire, answers that question in her picture book The Stars Will Still Shine. I don’t know Cynthia, so I cannot ask her, but I suppose this book was inspired by feelings such as my own. In this comforting poem, she shows us what to expect in the New Year. Can she see the future? Not really. But since the publishing of this book in 2005, she has been right every year! She begins, “This new year. . . the sky will still be there. The stars will still shine.” She writes of birds and ice cream, of cozy homes, of flowers, of light in the darkness, of grace. My heart leaps when I read her words, and I cling to the wings of hope—adding to her list. In 2015, there will be music! There will be hugs! There will be laughter and friends, sunshine and kindness from strangers. There will be ways to give, family dinners, inspiring sermons. There will be hot tea, books, and answered prayers. There will be God with us, and there will be Christmas once again! Thank you for using this picture book to awaken me to the assurance of your blessings, which overflow day after day, year after year. Amen. 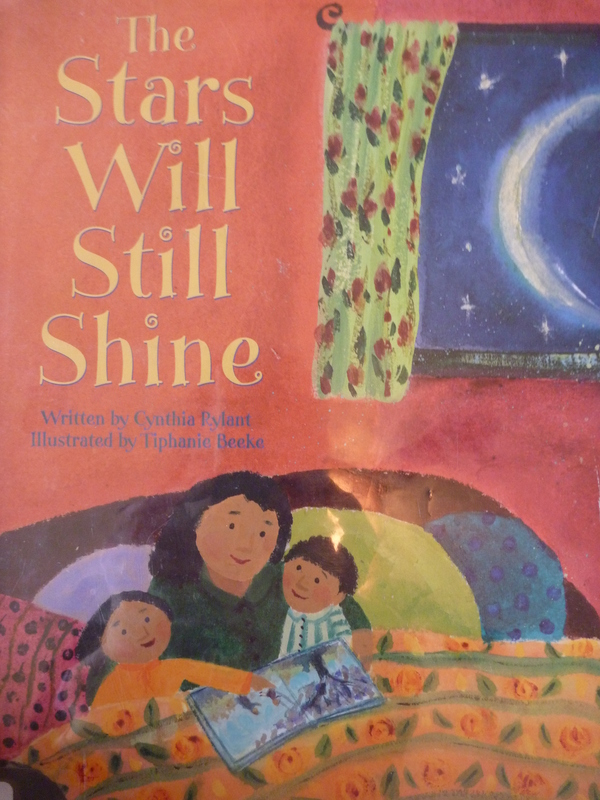 This entry was posted in Devotionals, Treasured Books and tagged A children's book about the New Year, hope for 2015, inspiration, The Stars Will Still Shine by Cynthia Rylant. Bookmark the permalink. The way you are able to put words together in such a creative, new way never ceases to amaze me. I am intrigued by the way you are able to put your feelings into expressive analogies that resonate so well with me. You are such a talented and sensitive and deeply expressive writer. How do you come up with these ideas?! I think it 2015 will be a year full of love, fun family time, travel, adventure, surprises, blessings, enlightenment, growth, abundance, and inner peace. I’m glad we will be experiencing it together! !